Whether you enjoy a refreshing cup of warming tea or the extravagance of a triple-filtered tipple, everyone needs a coaster in their life, to avoid messes and of course having to clear them up, especially if reads the truth! 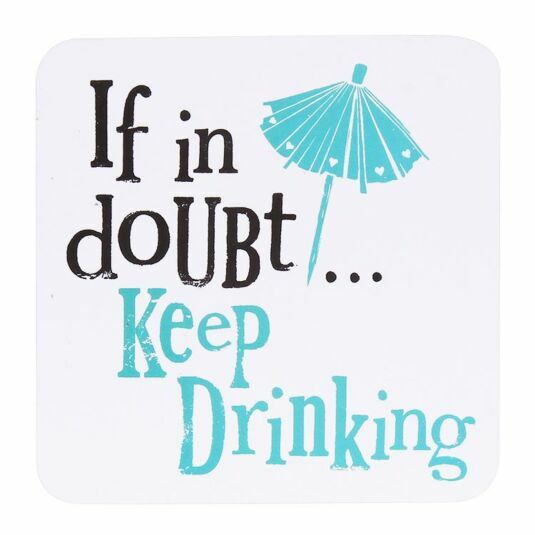 This coaster is the most humorous of additions to any living room, kitchen or dining room reading the words ‘If In Doubt… Keep Drinking’ in The Bright Side’s signature blue and black font with a detailed cocktail umbrella print. Backed with a bright white background and sitting on a bed of study cork, this coaster is coated on its surface to preserve the humorous design for years to come. Give the gift of humour… and of course practicality with this The Bright Side ‘If In Doubt… Keep Drinking’ Coaster, the ideal gift for any new homeowner, mother, and father and of course as a little treat to remind yourself that gin is ALWAYS the answer!